June | 2015 | Brand On! The Ladders, a leading career site, reached out to me recently and asked me to give advice to graduating college students. I’m honored to do it. Here are my top insights…nearly three decades past my graduation from UNC Chapel Hill. When I graduated, the economy sucked (sound familiar?). I couldn’t get a job applying my newly minted skills as a journalism major. For a few months, I stayed in Chapel Hill, delivering pizzas, waiting tables and working in an outdoor store at a mall. It was demoralizing, to say the least. It tooks me several months of hustling to finally land a job in PR, which meant moving to New York City and living with five flight attendants in a one-bedroom apartment. But I was determined to make it work. To young graduates, I say: Stay focused, even if you are schlepping through low-paid, agonizing work you hate. Don’t give up. Another thing—you have probably been told your whole life that you needed to go to school, get a degree and work for someone else. That’s one way to go…but you also have my permission to become an entrepreneur. When I was young, I hated the term networking. I thought it was slimy for some reason. Yet I did enough of it to land a few quality internships that eventually help me get that first PR job. It would take me years to understand that I should’ve focused on building a stronger network from the start. Great supporters are like money—you can take them to the bank. A few years ago, I tested this theory when I was forced to leave an entrepreneurial venture I had started. I desperately needed a “real job” to make up for lost salary and time. Fortunately, my networking efforts paid off quickly. You can read about what I did here during what I called my Open Source Job Search. Feel free to steal my playbook. My advice is to treat your network like gold—and stay in touch with them regularly (not just when you are desperate or need something). Three years since that job search, I’m happily back doing what I love as an entrepreneur. But I still email my entire list of contacts every two weeks without fail. You’re never too young to give back to others. In fact, the more you give, the more you’ll get. You might not believe it, but just take my word for it. Why should I stop what I’m doing and write this article, for example? Because it might help one person on their journey. That’s all I care about right this moment. I know plenty of older people helped me when I was young, scared, untalented and naive…and I probably didn’t even recognize their contributions at the time. Now I know better. Wherever you find yourself, you can always give something back. I find it especially vital to never turn down a request by young people for advice. You just have no idea what impact you can make. One more thing–used tools like the Ladders, LinkedIn and social media to your full advantage. I didn’t have any of that stuff when I graduated. Be grateful for the times you live it, with such amazing technology at your fingertips. Need to make a quick graphic for your blog, social media site or a presentation? 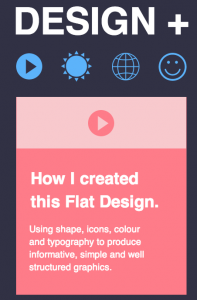 Canva lets anyone create graphic design layouts quickly, with minimal design skills. It won’t replace a bona fide graphic designer, but it’s great when you need something easy and cheap. Canva features a lot of predetermined graphic sizes ranging from social media graphics to blog graphics, Facebook covers, cards and more. It also has many free stock images, fonts and background images. Canva also offers over 1,000,000 premium graphic files that you can purchase cheaply (around $1/graphic). After you create a graphic in Canva, you can easily download the file or share it on Twitter and Facebook.